When you have a drip irrigation system for your potted plants, you know life just gets easier. The system also saves you a lot of time so for me, it was an incredible investment. Not to mention, the irrigation system is also very easy to install. Thus, you can make your own as a well-spent project, it doesn’t take much time and it’s totally worth every second! 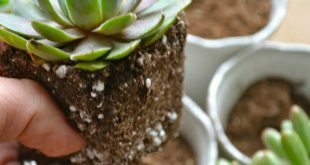 Hence, follow these easy step-by-step instructions to make your own DIY drip irrigation system for potted plants. Nothing to lose but so much to gain! Watering potted plants should be easy so a DIY drip irrigation system is perfect for this. Think of it like it is an automatic watering system for pots and containers. It will hook right into your garden hose so when the water turns on, all of your pots will get watered at the same time. Doesn’t it sound amazing? Also, you could turn the water on manually or set it up on an automatic timer. For me, this was a lifesaver. Check it out! 1. First off, attach connectors to a faucet or a hose. You should start attaching the irrigation backflow preventer onto your hose and then the pressure regulator, lastly being the faucet hose fitting. Thus, you’ll see that you are simply chaining the garden hose attachments together. 2. The second step consists of attaching the 1/2″ poly tubing to the hose fitting. After you are pushing the tubing into the hose fitting, pull down the collar on the hose fitting piece, and tighten it to secure the tubing. 3. Then, you need to figure out your drip irrigation system design. Thus, determine how far apart the drip heads should be so you know exactly where to install the micro tubing. 4. After deciding on the design, make sure you also know how long the drip lines should be. Thus, measure how long each piece of the micro tubing needs to be for the drip lines. 5. Install the irrigation micro tubing, just add the drip lines and the micro sprinkler heads. Punch a hole in the mainline poly tubing where you want to add the micro tubing drip lines. Then, you should attach the drip line connector first to the main line tube. After this, make sure you attach the micro tubing drip hose onto the other end of the connector. 6. Install the irrigation drippers, all you have to do is plug them into the open end of the micro tubing. Then, put them into your container. 7. Now, it is time to test out your irrigation setup. So, make sure everything is working properly and you don’t have any leaks. Also, if you got to this point, a good idea would be to adjust the drip heads. The heads twist so you can control the amount of water that comes out. 8. After you install the setup properly, make sure to secure the poly tubing into the ground with some 1/2″ drip irrigation tubing stakes. These are the ones that will secure the tubing, which you could also bury it in the mulch for a cleaner look. 9. Now, all you have left to do is to set the timer for automatic irrigation. Thus, now you never have to worry about watering these pots again. This was such an easy project to make and your vegetables will get their consistent amount of water.